"Roman Aosta: Monuments and Epigraphy"
Carolynn E. Roncaglia completed a B.A. in History and Classics at the University of Virginia in 2003 and a Ph.D. in Ancient History and Mediterranean Archaeology at the University of California, Berkeley in 2009. She has done archaeological fieldwork at a Roman villa/early Christian church near Ravenna and has spent several summers hunting down inscriptions in Greece and Italy. Prior to coming to Santa Clara, she taught at UC Berkeley and Claremont McKenna College, and she taught courses on ancient and medieval history, literature and language. 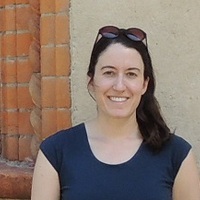 Her research interests include Roman history, Greek and Latin epigraphy, Hellenistic history, Greco-Roman Egypt, and pre-Roman Italy, and she has written articles on Corinthian inscriptions, regional networks in Roman Italy, client-kingship in the Alps, and urbanization in Sardinia, Corisca, and Italy north of Rome. Currently she is preparing her dissertation, on the impact of the Roman state in northern Italy, for publication as a monograph. ).